When you buy Mexican street corn from a cart in the plaza you have two options for ordering, on the cob called elotes or in a cup called esquites. 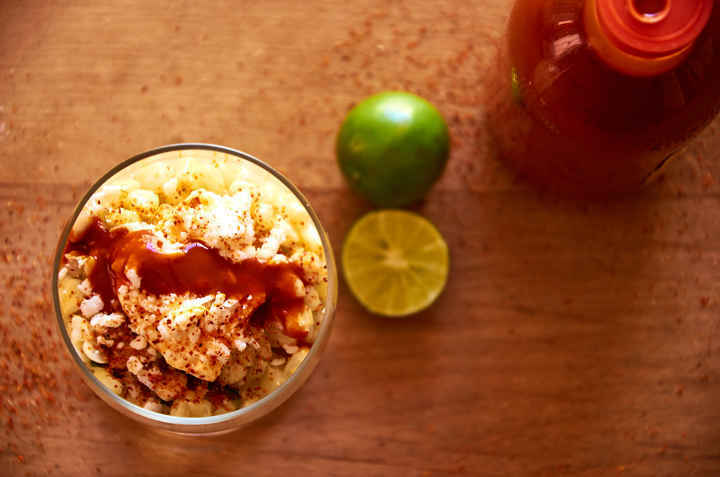 The cart will always be loaded with toppings for your corn; lime juice, mayonnaise, grated cheese, chili powder, butter, and hot sauce so that you can personalize your cup. 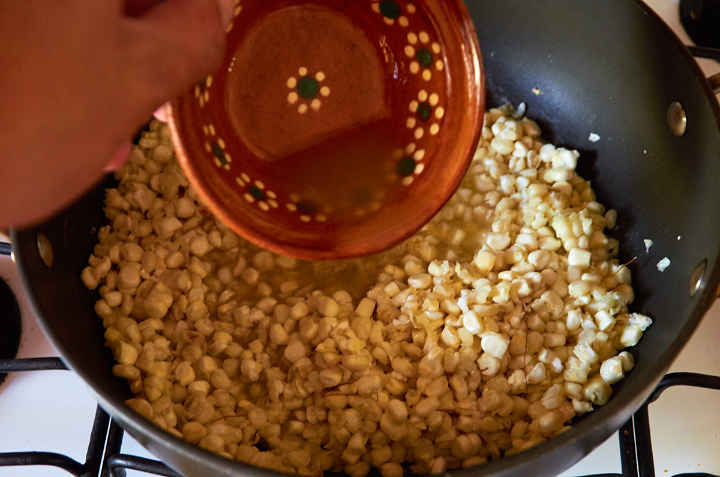 In this recipe we’re making esquites, the street corn in a cup. Going to get corn in the plaza is one of our favorite things to do on a weekend evening. Now you can recreate the experience at home. 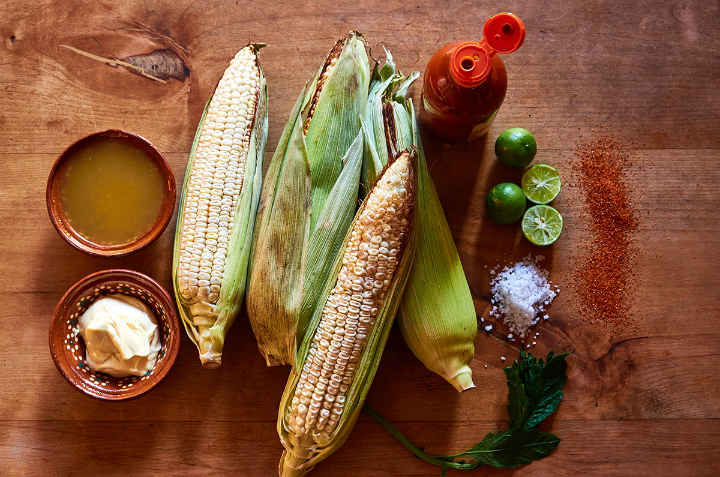 If you want authentic flavor, you have to prepare this dish with white Mexican corn, elote blanco, not sweet corn. 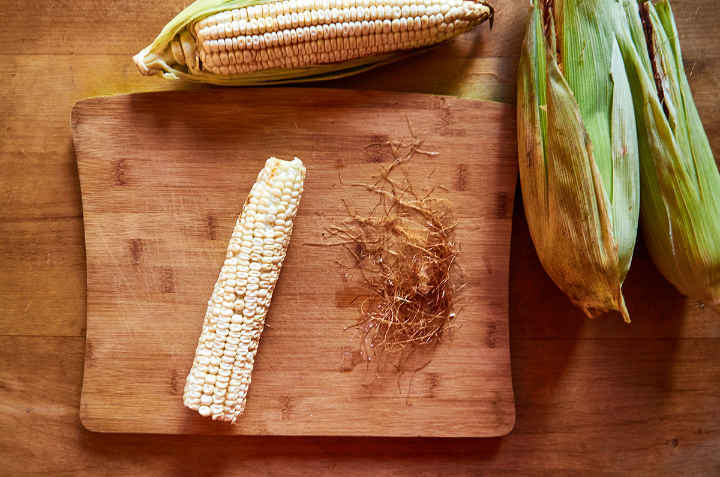 Mexican corn is much firmer, not sweet, and has an earthy, grain like taste. The first time I ate elote blanco I was confused. It tasted nothing like the soft sweet corn that I was used to eating. At first, I wasn’t sure that I cared for it but after a few more tries the taste grew on me. I’ll happily eat it every day now. Start by removing the husks and silk from the corn. Cut off the top and base of the cob. This will make it easier to cut the kernels off the cob. Remove the kernels from the cob. Hold one end of the cob with your hand and place the other end of the cob on the cutting board. Hold the cob at a 45-degree angle. Use a sharp knife to cut the kernels off and be sure to always cut away from your hands and body. 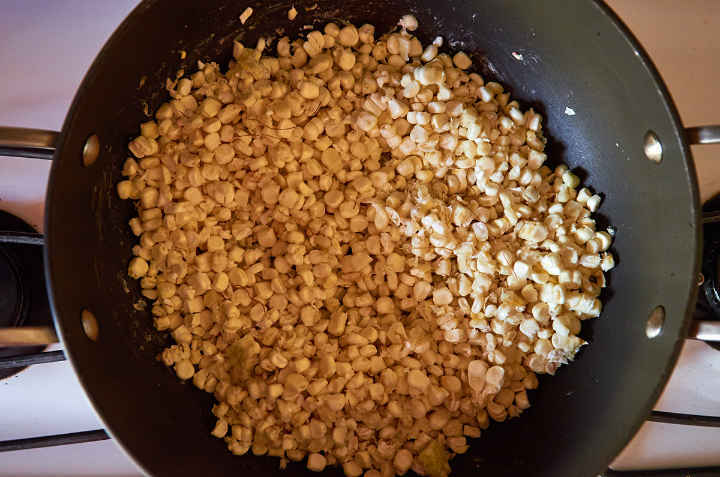 Place the kernels in a pan. Add 1 cup of chicken or vegetable broth. Add the epazote and salt. Bring the water to a boil then reduce to medium. Cook until about 2/3 of the liquid has evaporated. 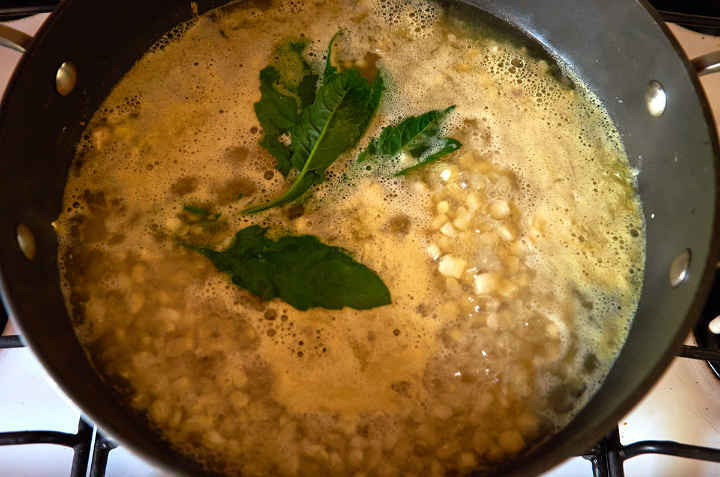 If the corn is still too tough for your after the liquid has reduced add 1 cup water and cook until you get the desired texture. Repeat if needed. You want a little bit of liquid to remain. It goes in each cup when you serve. Serve your corn warm in a cup and then add the toppings of your choice. My perfect cup is like the one in the photo, just a squirt of lime juice, a pinch of salt, a dab of mayonnaise, a sprinkle of chili powder, and a good squirt of hot sauce. Shall we serve you a cup? Looks good doesn’t it! 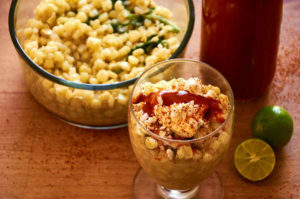 Mexican street corn in a cup, "esquites" prepared with "elote blanco," Mexican white corn. Personalize with lime juice, mayonnaise, grated cheese, chili powder, butter, and hot sauce. 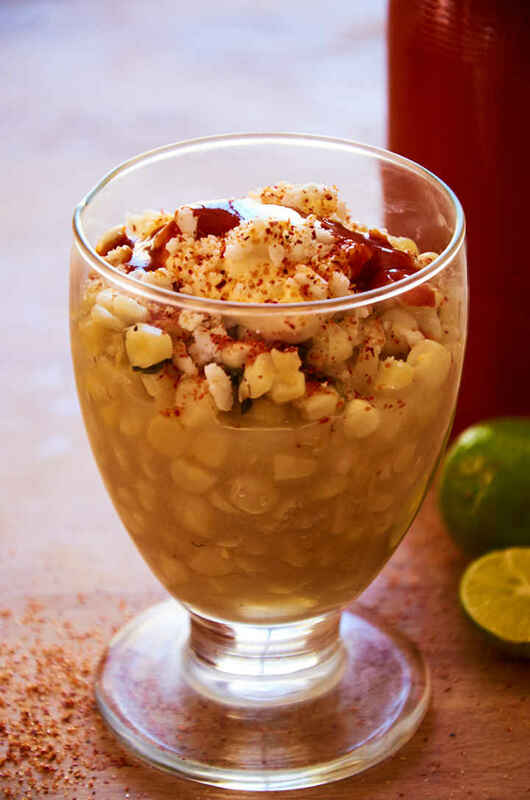 Recreate the experience of going to the "elote" cart in the plaza on a relaxed weekend evening. Start by removing the husks and silk from the corn. Cut off the top and base of the cob. Remove the kernels from the cob. Hold one end of the cob with your hand and place the other end of the cob on the cutting board. Hold the cob at 45-degree angle. 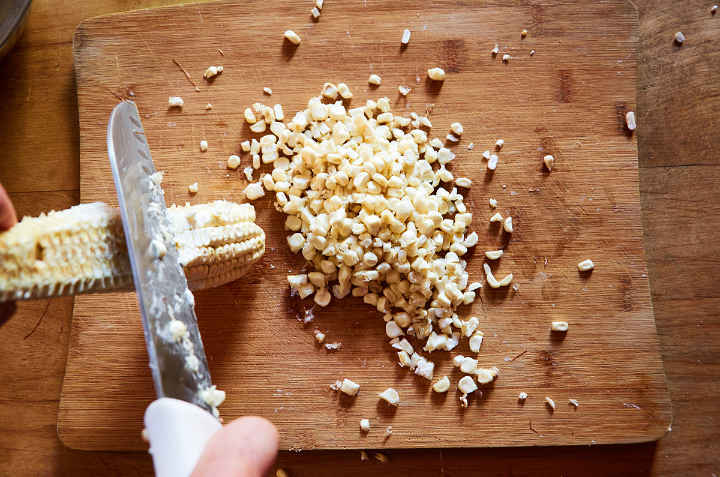 Use a sharp knife to cut the kernels off and be sure to always cut away from your hands and body. 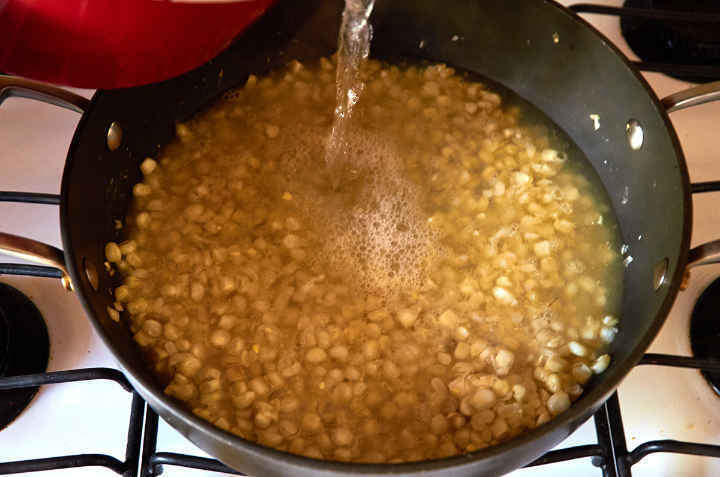 Place the kernels in a pan. Add 1 cup of chicken or vegetable broth and 4 cups water. Add the epazote and salt. Bring the water to a boil then reduce to medium. Cook until about 2/3 of the liquid has evaporated. 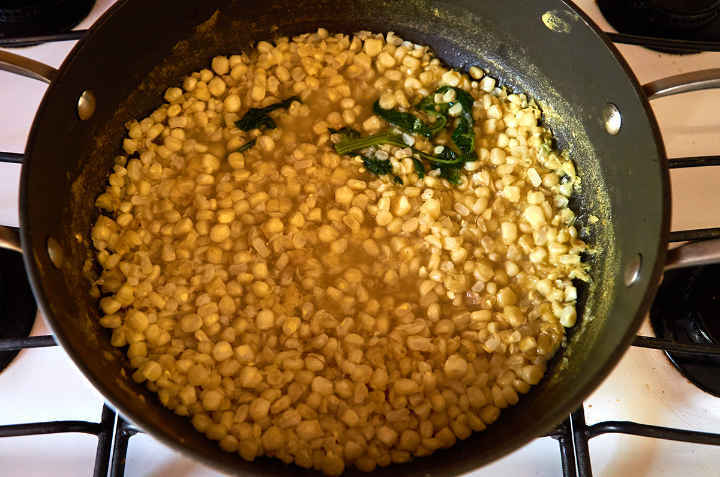 If the corn is still too tough for your after the liquid has reduced add 1 cup water and cook until you get the desired texture. Repeat if needed. Serve your corn warm in a cup and then add the toppings of your choice. The corn will keep 3 days in the refrigerator. Do not store prepared with all the toppings. Reheat in the microwave before serving.